New Era Compost -- is made exclusively from dairy manure blends, (Milk Cow, Dry Cow and Calf Manure). It goes through a controlled thermophilic, bio-oxidative process, lasting from 90 to 120 days. During this process, temperatures reach a maximum high of 158 0F, with an average thermophilic temperature of 140 0 F.
New Era Liquid Compost -- is a soluble extract derived from composted dairy manure that has gone through a thermophillic controlled biological oxidative process. It can be applied to soil, metered through irrigation systems, and applied to foliage. New Era Root Stimulant has been shown to stimulate better root systems that can increase the efficiency of applied and existing nutrients. 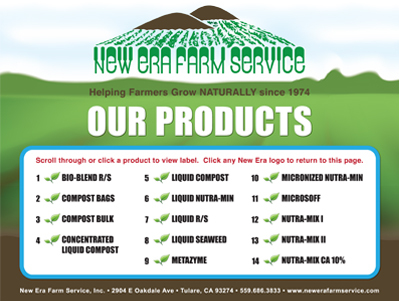 New Era Concentrated Liquid Compost -- is a soluble extract derived from composted dairy manure that has gone through a thermophillic controlled biological oxidative process plus ocean-going fish, humic acid derivatives, seaweed extract, yucca schidigera, cane molasses. It can be applied to soil, metered through irrigation systems, and applied to foliage. New Era Root Stimulant has been shown to stimulate better root systems that can increase the efficiency of applied and existing nutrients. New Era Liquid R/S – is a soluble extract derived from composted dairy manure that has gone through a thermophillic controlled biological oxidative process plus humic acid derivatives, seaweed extract, yucca schidigera, cane molasses. It can be applied to soil, metered through irrigation systems, and applied to foliage. New Era Root Stimulant has been shown to stimulate better root systems that can increase the efficiency of applied and existing nutrients. New Era Micro-Soff – is an organic acid liquid formulation of citric and humic acid derivative blends. It has a pH of less than 2.5, which can help buffer high pH and sodic soil conditions. It is ideal for helping to clean drip systems, safe to handle, and does not burn the skin. After 90 days it will break down leaving short chain sugar carbons which can help stimulate biological activity. New Era Nutra Min – is from a natural occurring substance that was formed when ancient plant and sea life was subject to eons of Hydra-Thermal reactions (not volcanic). Nutra Min consists of fibrous material that contains almost all of the know macro and micro elements. This mineral rich material is naturally “bonded or chelated” colloidal clay with the base particles as Silicon not silica (sand) which makes up approximately 30% to 45% of the bulk. Nutra Mix I – is a liquid formulation of essential plant nutrients designed to help supplement a well-balanced crop nutritional program. Nutra Mix I is derived from ocean-going fish, seaweed extract, colloidal clay minerals, cane molasses, yucca schidigera and humic acid derivatives. These are all organic materials used to aid in early cell development and vigor, during periods of active plant growth. Nutra Mix II -- is a liquid formulation of essential plant nutrients designed to help supplement a well-balanced crop nutritional program. Nutra Mix II is derived from seaweed extract, cane molasses, yucca schidigera, colloidal clay minerals and humic acid derivatives. These organic materials are used to aid in early cell elongation and maturity, during periods of fruit development. Metazyme – is a high energy metabolic plant stimulant. Metazyme is derived form cane molasses, seaweed extract, colloidal clay minerals, and yucca schidigera. Small amounts can stimulate the plant’s metabolism, increasing nutrient uptake and movement with the plant. Metazyme is a natural chelating agent; the amino-organic acid compounds may stimulate growth or in higher applications can shift the metabolic sync from vegetative to reproductive growth. New Era Bio-Blend R/S – is a “non-manure” based soluble extract blend of beneficial microbe, enzymes, humic acid derivatives, colloidal clay minerals, seaweed extract, yucca schidigera and cane molasses. New Era Bio-Blend R/S can be applied to the soil, metered through irrigation systems, or sprayed on foliage. MycoApply Mycorrhizal Inoculants – Endo and Ecto Mycorrhizae in granular, liquid and powder formulations. Acadian Seaweed Extract – is derived from fresh Ascophyllum nodosum seaweed harvested from the cold and clean North Atlantic coastal waters of Nova Scotia, Canada. The natural properties of the seaweed are extracted using a low heat processing system, which preserves the maximum benefits of the live seaweed. Therm X70 -- Therm X70 is a natural wetting agent derived from yucca. It contains 70% concentrated yucca extract, which helps plants overcome adverse water conditions and is a great sticker for other sprays. It will increase your crop's ability to germinate and establish in stressed conditions, and well as increase its water and fertilizer uptake. It is an excellent aid for water penetration. Humic and Humic Acid Derivatives -- derived from leonardite shale, a natural source of humic substances and trace elements. Available in dry, micronized, prilled and liquid formulations. Brand names are Activate 80, Jenner 8, Integrate, and Premium 6. Actagro Products – Structure, Monarch, Liquid Humus, Cache, and all micronutrients. All of Actagro’s products are manufactured with a patented process with Organic Acids derived from Leonardite including humic, humin and fulvic acids.